Over the past ten years, this magical island has been transformed by Rippleffect into an educational eco-campus, but Cow Island’s diverse history begins much further back. It is hypothesized that Cow Island’s name was derived from its use by local farmers in the early 1800’s as pastureland for grazing animals. The ocean provided natural protection from predators and was a natural fence that kept livestock from wandering. Incidentally, this agrarian past provides the derivation of many Maine island names, such as Sheep, Cow, Goat and Ram. In 1873, the U.S. Army purchased Cow Island for the purposes of defending Portland Harbor, but construction on the outpost that was later named Fort Lyon didn’t begin until 1901. A company of approximately 100 men lived on Cow Island during World War I and again during World War II, but the fort never saw any direct military action. After World War II, the US Army sold Cow Island and what was left of Fort Lyon to a private landowner. The Maine Coast Heritage Trust holds a conservation easement for 26-acre Cow Island which protects public access in perpetuity. This easement also limits the number and size of structures built on the island. All new structures have either been built on existing foundations or are temporary, and all structures are situated so that they cannot be seen from the waters of Casco Bay, thereby preserving the natural landscape. Rippleffect owns Cow Island thanks in part to the enormous generosity of MCHT, and we continue to work closely with them to ensure that Cow Island remains protected forever for all. Cow Island’s western shore is open to the public at all times, although visitors are requested to register with the Rippleffect office. If you are planning to stay overnight, we require that you register your party and read our general use policy prior to visiting. Keep in mind that our dock is private and is for the express use of Rippleffect’s vessels. You are welcome to pull your vessel up on the western shore or anchor out. Strong currents and ocean swells exist in nearby Hussey Sound. Visitors should be mindful of ticks on Cow as well as poison ivy, which is common near the public campsites and western trails. Camping is permitted at any of the designated sites on the western side of the island. The coves near the shipwrecked lobster boat offer the best options for landing and access. Larger boats can anchor amidst the private moorings on the west side. Except in emergencies, use of the dock is prohibited. Use established trails and stairways to help preserve delicate plants. During your stay, please confine your exploration to the west side. Programming is in progress from March to November each year. Cow Island is located on the Maine Island Trail. Please sign in to MITA’s guidebook (located in the public kiosk) and let us know about your stay. Both Rippleffect and the Maine Coast Heritage Trust request that you follow all posted guidelines and leave Cow Island better than you found it. Your cooperation is appreciated. We hope your visit to Cow Island is safe and enjoyable. Please help us keep this island beautiful and clean for all to enjoy! Please click here for a printable version of our general use policy and detailed map of Cow Island. Cow Island is governed under a comprehensive conservation easement through the Maine Coast Heritage Trust. This legal document prohibits the destruction of plant life, harassment of animals and the outward alteration of the historic structures. Please help us to keep our promises and abide by these guidelines. Alcohol/Drug Policy: Rippleffect serves youth and adults with high quality adventure programs on Cow Island. The overindulgence of alcohol or any other drug is at odds with the spirit and purpose of our use of the island. Please use your best judgment when choosing to use these substances if you are of legal age. Bear in mind that illegal drug use is not tolerated and any evidence of this type of activity will be reported to the authorities. Camping: Overnight use of the campsites on the public side of the island requires registration with Rippleffect. Call Rippleffect at 207.791.7870 or email info@rippleffect.net to hold your spot and to learn about our camping policies. Please plan to register at least 7 days in advance of your projected overnight camping. 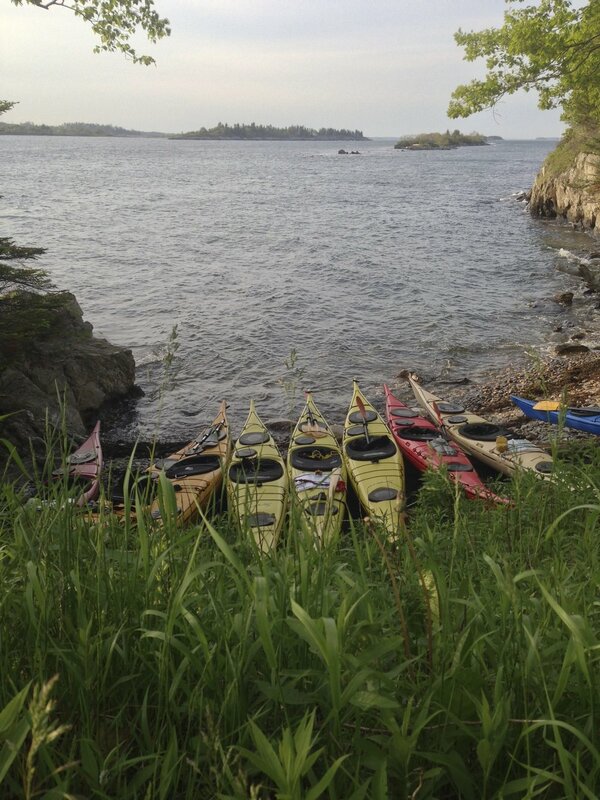 Campsite Location: Three designated campsites are on the western side of Cow Island. The best access to the island is on the northwest side. The campsites are small and cannot accommodate more than four people per site. Toilet facilities may be used. Comfortable, clean and odorless composting toilets exist in the middle of the island and off the SW side of Cow. Toilet access is clearly marked with signs. Fires are by permit only on Cow Island. Obtain fire permit through the town of Long Island, 207-766-5820. Fires are only permitted at designated public campsites in pre-established fire rings. Please prepare to bring your own wood for fuel. Do not destroy trees or shrubbery and please leave standing dead wood where it is! All fires must be extinguished with water, no later than 12:00 am. As a former military base, Cow Island has many identified and unidentified hazards, not the least of which are sharp objects (metal and glass) on the ground. Closed-toed shoes are highly recommended while on the interior of the island. Please be mindful that beaches may also be sites where these objects appear! Program-related facilities are not for public use. Fresh water is not available. Please bring as much fresh water as your group will require for the duration of your stay on Cow Island. Poison ivy does exist on the island, so please be careful when exploring. Ticks do live on Cow Island. Careful observation is your best weapon. Long pants help. More information on poison ivy. Ledges and drop offs: Cow Island’s military installation was originally built to defend against military attack. Dangerous drop offs and difficult pitches exist. Please be careful when walking at night.